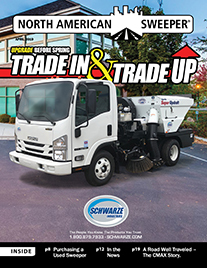 For this month’s Spotlight we interviewed Mr. Tom Peters, President and Co-Owner of Extreme Power Cleaning who are located in Roselle, Illinois. Lou Rotella started the business back in 1985 when he was working for Forklift Company, where he started as a technician. He bought his first sweeper truck, a very used and old model that he worked on and worked and learned everything about the mechanics, etc. in the process. I owned a snow removal business, having worked in that field since high school. We also did heavy equipment excavation work Lou and I met around 2006. When we got together Lou and I would talk to each other about our respective businesses. Lou had over the years developed great working relationships with a few clients that kept asking him to remove the sometimes heavy snows from their parking lots, etc. We operate in Roselle, IL a suburb of Chicago. All the suburbs and the city proper are affectionately called Chicagoland by the locals. During the major economic slump, or recession my excavation business went under. After talking with Lou we put together a vision for a company that would combine the best of each of us. We incorporated in 2012 and began our wonderful business journey. Q: What is your business model? How have you structured your business? What plans, models, or organizations, configurations, did you envision when you thought about how you wanted to set up your business structure? Lou has a great knowledge of truck mechanics. He has used exclusively Tenant Sweepers, and he also put them to good use for industrial scrubbing work. With my background in snow removal we figured it would be great to combine the scrubbing work with the snow removal work. Both Lou and I had built up a substantial clientele, his sweeping and scrubbing clients and my snow removal and pressure washing clients. We knew from the start that we wanted to be more of a niche business and do mostly inside parking lot, etc. jobs. Next we purchased a trailer to move the big machines around. Right from the start we didn’t just want to be a 2 or 3 person company. We wanted to scale our growth and so far it has worked out great for us. One aspect of the business I contributed was a huge marketing component to the business. The first thing I did was to put up a company website. We now do target marketing and we are proud to say that we have close to 100% client retention rate. Q: What kind of trucks and equipment would we see in your garage? Lou made a choice a long time ago to use Tennant Sweepers. 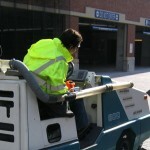 We operate 5 Tenant 800 sweepers, and mostly use Ford and Chevy trucks. 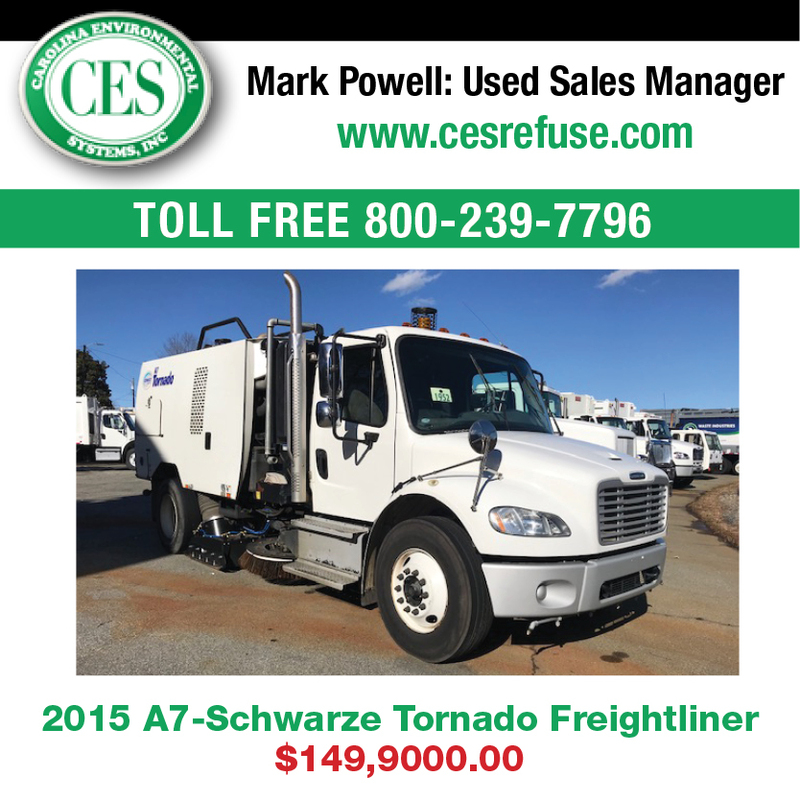 We operate an F250, a F450, 2 new 2015 Chevy 3500s and a 1 ton dump truck. We like the mileage you get from diesel engines so all of the trucks have diesel engines, automatic Allison transmissions. 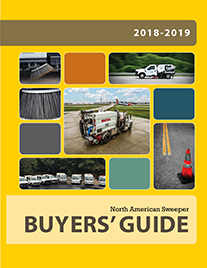 Most of our sweeper trucks can hold up to 3 yards of debris, which we collect at the job site and then bring the waste back to our yard for dumping. Each truck is also equipped to handle a number of different size snow plows, as well as Swenson salt spreaders. For all of the debris we hire a dumpster company, who comes, roles the dumpsters off, we fill them up, and then they return with the empty ones and ready to pick up the newly filled ones. It’s very and environmentally safe and friendly. For a lot of the heavy scrubbing work we also use Tennant machines. We own and operate a T20, an M20, and the Tennant 5700, and 3 7400 models that we are phasing out. Lou is a great mechanic and he knows all about how the Tennant machines work. The company is really solid and we can still get parts for all of the machines, etc. Since none of these machines use water, this gives us a huge advantage when it comes to controlling dust. Q: Tell us about your client base. We have dozens of clients we serve on a regular basis, including large and small construction sites, warehouses and, of course, numerous parking garages. Since we started we have substantially expanded our parking lot work. Now we work for numerous Condo and Apartment Associations and they give us plenty of work. Our biggest client is one of the largest real estate investment companies in the world, Prologics, and they supply us with a never-ending line of jobs that we do for their many properties in Chicagoland. 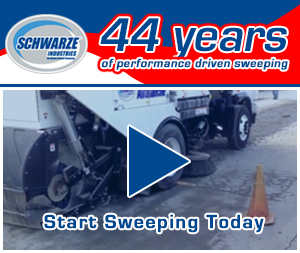 We can sweep, scrub, pressure wash any space they need cleaned up. We like using the smaller trucks because they can really get into the nooks and crannies and allows us to do very detailed work. Q: Tell us about the employees that work for the company, their titles, and the jobs that they perform. My wife Diana is our office manager and she takes care of all of the bookkeeping, payroll, and accounting. Lou does all of the scheduling of the jobs and he runs the day-to-day operations. I take care of all of the marketing, advertising, promotions, etc. as well as all of the equipment purchasing. I travel all over, looking for the used equipment of the highest quality but at the best price. Since I know I can rely on Lou’s expertise at truck mechanics, I can find some really good deals. He then fixes them and we put them to work. Plus, altogether we have 5-10 technicians working on a regular basis. Q: What is the breakdown on the different divisions of the company? I would say that it’s actually pretty even, with our sweeping we do about 33%, the scrubbing work is another 33%, and finally there is the power washing, which is also about 33% of our business. Q: Can you please speak to the types and kinds of growth that your business experiences? Are there patterns you have recognized? What problems have you faced, and how have you handled them. During our few years we saw a 50% growth due to our joining forces and expanding our client base and business prospects. In our third year we saw a 25% growth rate and it in the last two years is the growth rate has been roughly 15%.